Peach Leaves and the bark of the peach tree have been used to treat gastric and stomach irritations and abdominal tenderness, irritation, or congestion. Peach Leaf has also been used to treat irritation of the throat and for soothing bronchial mucous membranes, for bad breath, headache pain, high blood pressure, and externally for burns. Its considered to be anthelmintic, astringent, antifungal, and it has been used for treating minor skin irritations.The leaves are also believed to have sedative effects and so have been used for sleeplessness and insomnia. 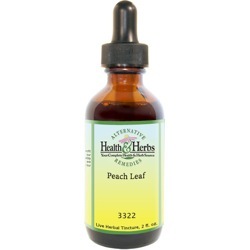 Peach Leaf has been found almost a specific for irritation and congestion of the gastric surfaces. It is a valuable herb for controlling the vomiting and easing extreme irritability of the stomach. The extract is found to be useful for chronic diarrhea and dysentery, chronic hepatitis, and dyspepsia. This herb is strengthening to the nervous system, is a mild sedative, and is useful for chronic chest complaints. It is also used in whooping cough, as it helps with chest congestion, as well as chronic bronchitis. The Peach leaf extracts are rich in purified a-glucans, which may protect against environmental toxins. The extract exhibits action on cell growth and may help to slow the sign, of aging, with a noted decrease in crow's-feet wrinkles and reduction in roughness of the skin. Peach leaves were used by traditional herbalists for the healing sores and wounds. Modern-day hair care product formulas seem to have revisited the annals of natural herbal hair care. Traditional American Folklore has shown the use of Peach leaf tea, or tincture, as a conditioner for hair and as a hair growth aid. It is believed to create more volume, for dry lifeless hair, and more body and shine. Ingredients: Peach Leaf, Structured Water, and 20% alcohol. Non-Alcohol: Peach Leaf, Structured Water, and Vegetable Glycerin.